This summer we saw massive builds of iron ore (see post) and steel inventories in China. That drove domestic prices to new multi-year lows (see post). 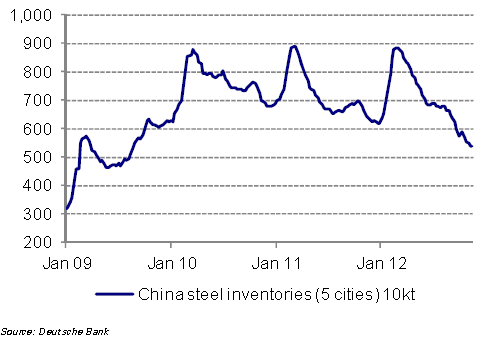 With China's economy beginning to stabilize (see post), these inventories are now declining. According to Deutsche Bank, the restocking of these inventories should increase production and result in moderate price increases for iron ore. This is by no means a start of a new commodity boom - the market remains well supplied. 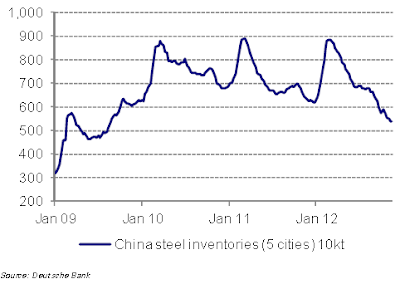 DB: - We expect that steel production rates in China could rebound into the end of the first quarter and potentially approach the 2.1mt/day level during the year. 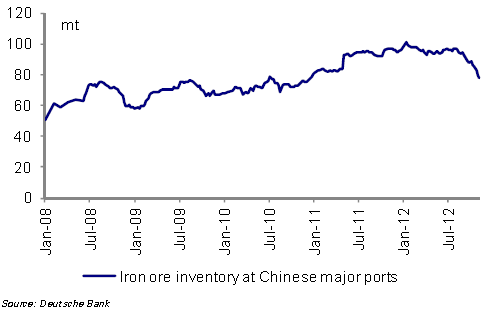 We expect that this in addition to a modest restocking event should help to push iron ore prices higher into mid-year.